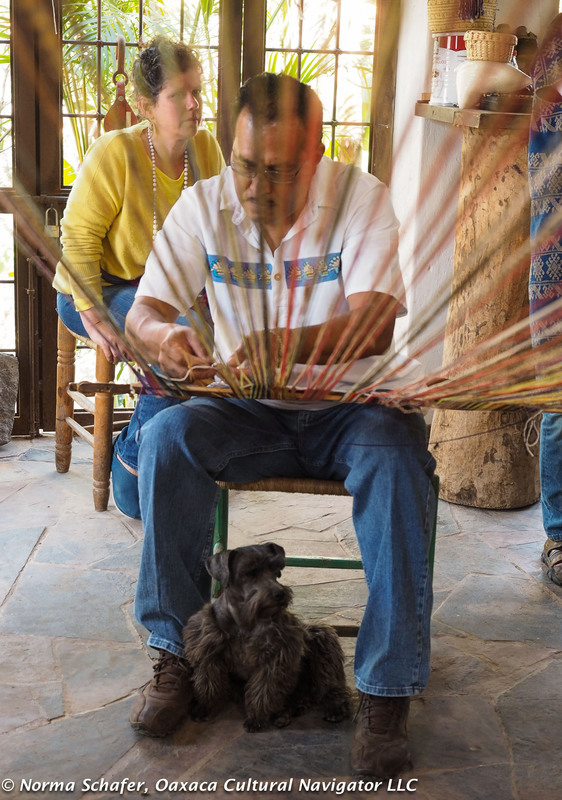 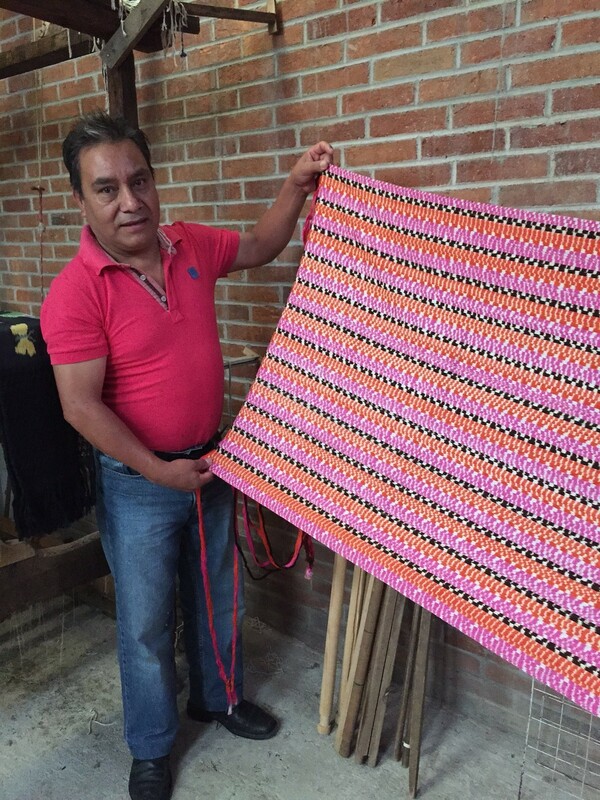 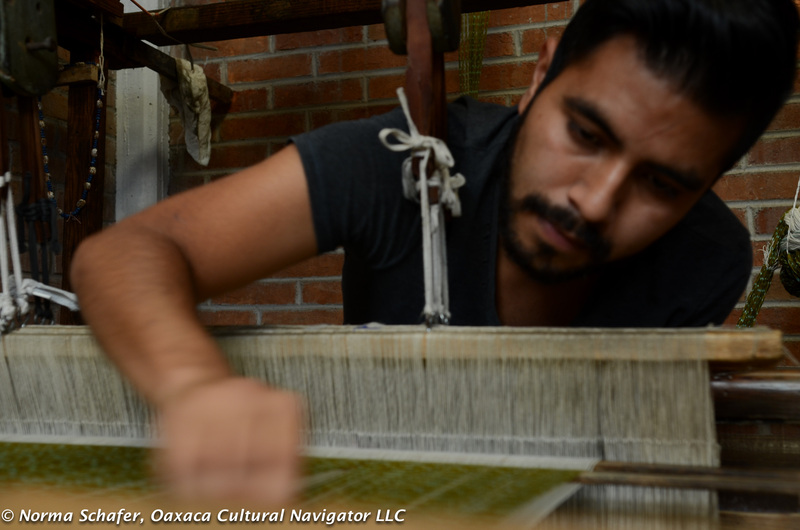 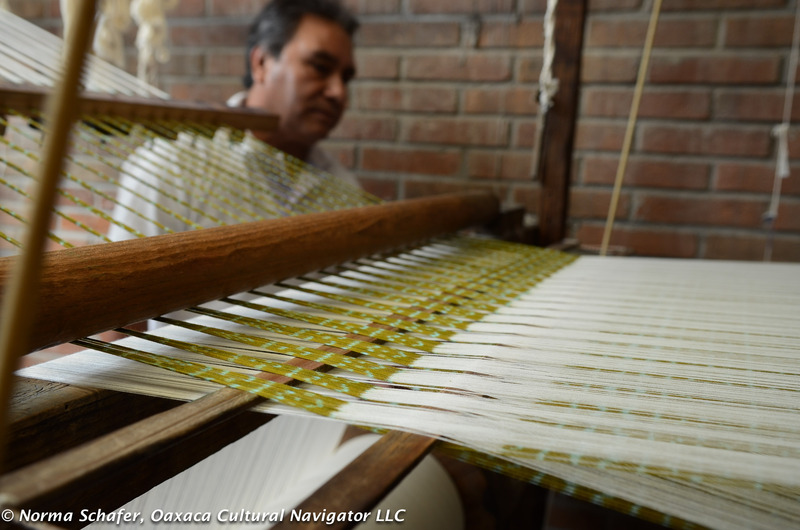 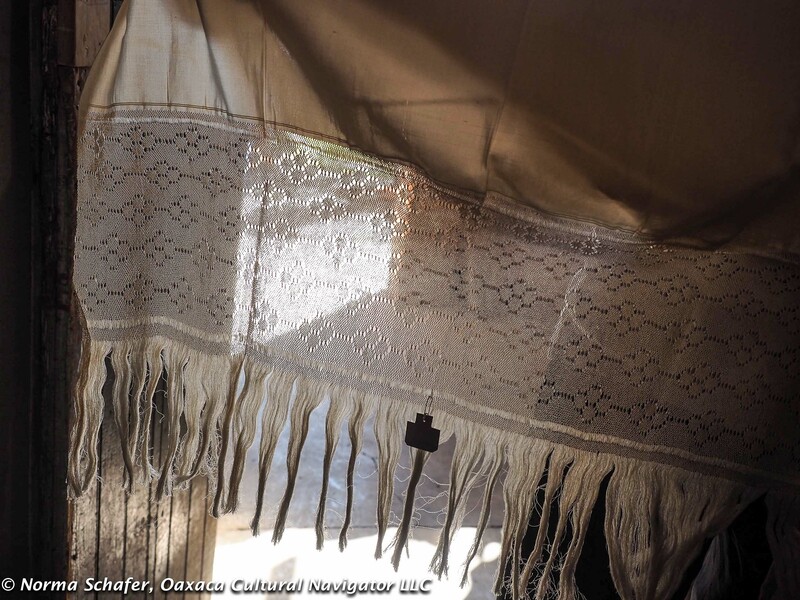 Jesus Zarate is a talented weaver who works on both the flying shuttle peddle loom and back strap loom in his workshop at Cuauhtemoc Oriente #312 in Tenancingo de Degollado, State of Mexico. 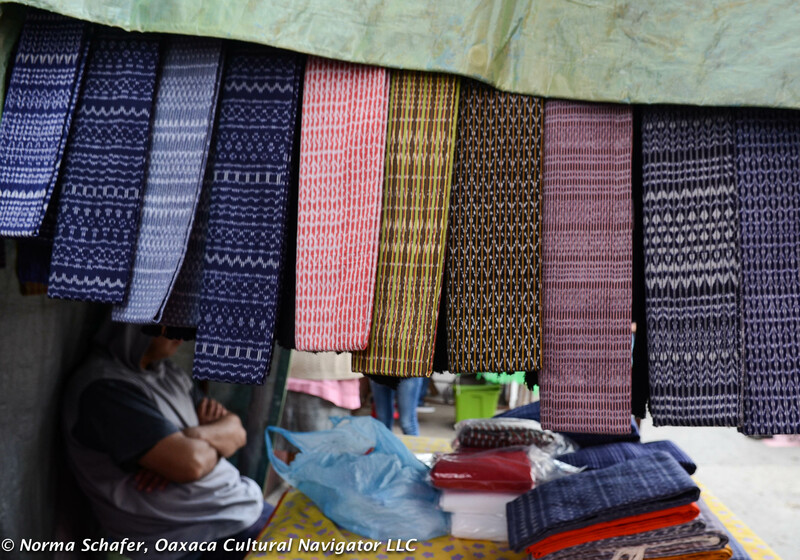 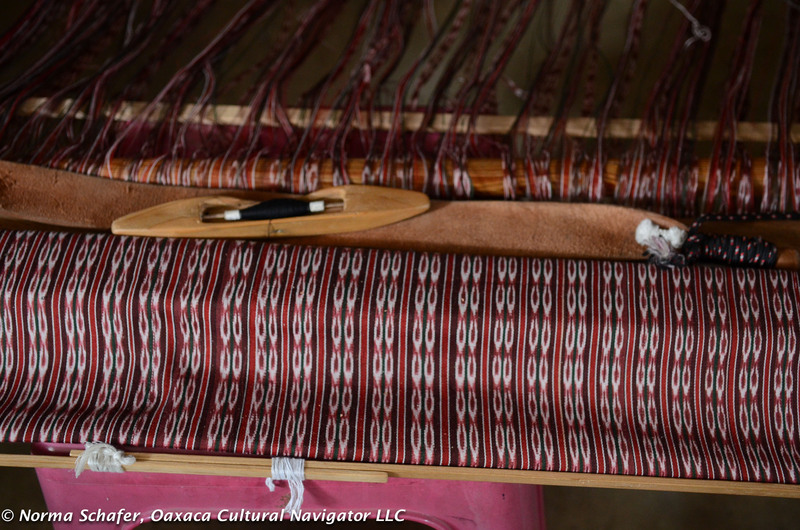 His work is an outstanding example and among the best of the ikat weavers or rebozeros. 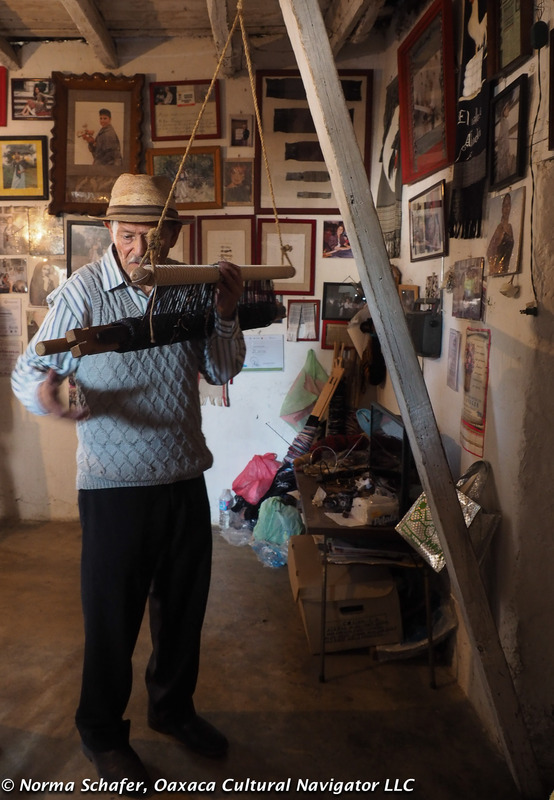 He is more than an innovator. 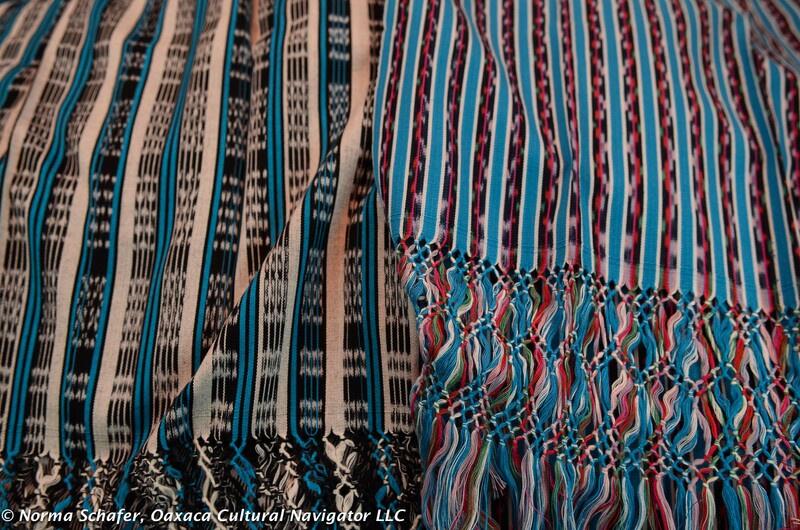 His work is like wearing a Monet painting of water lilies. 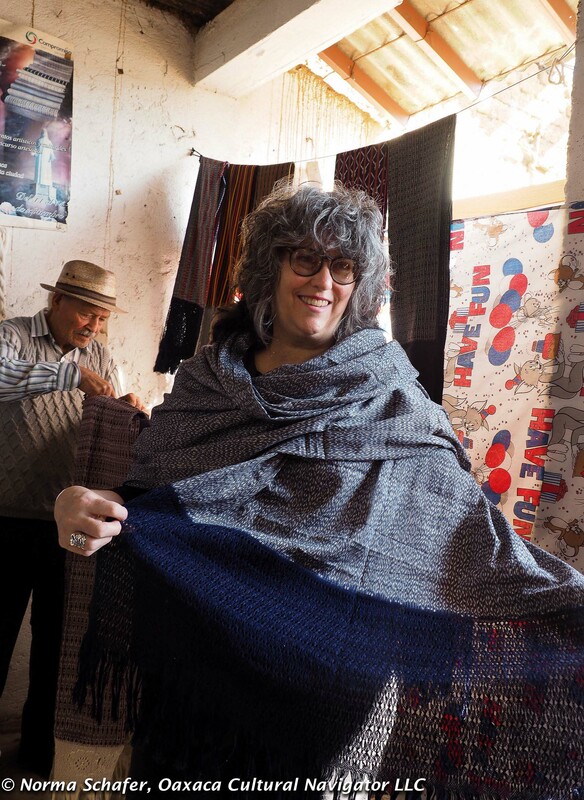 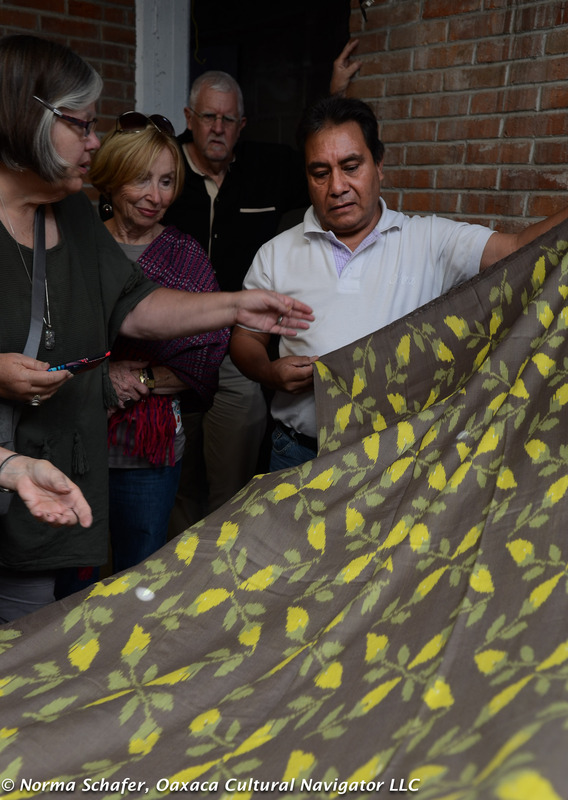 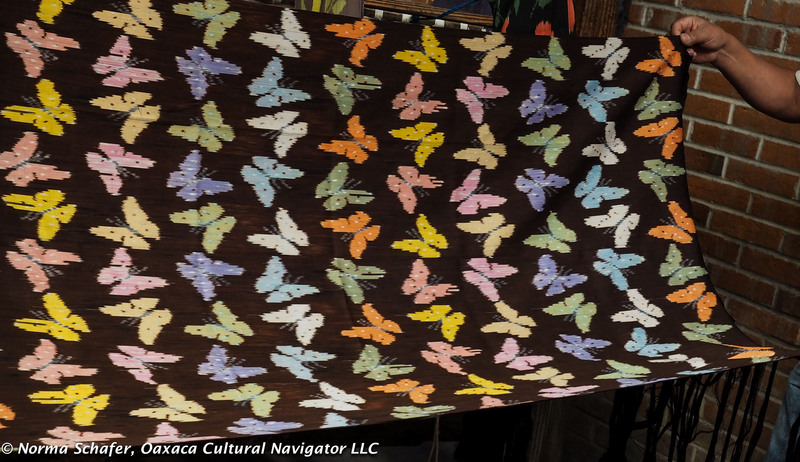 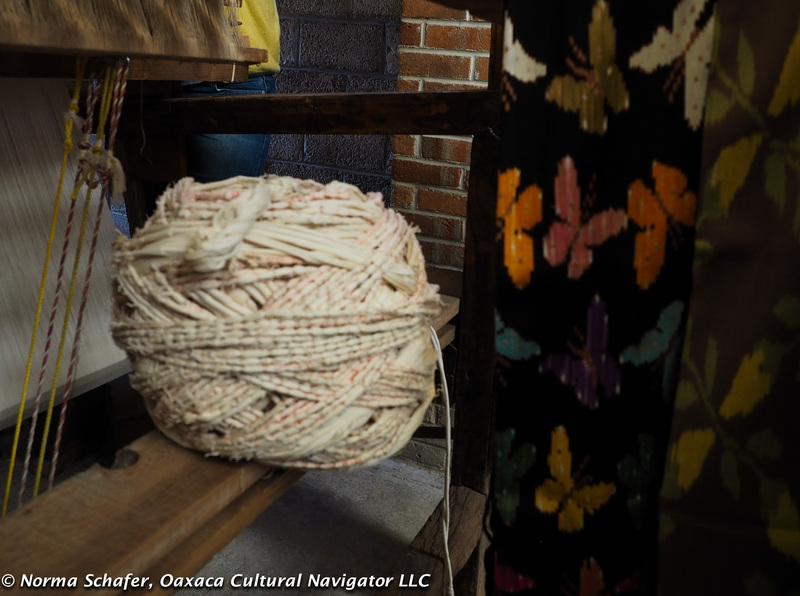 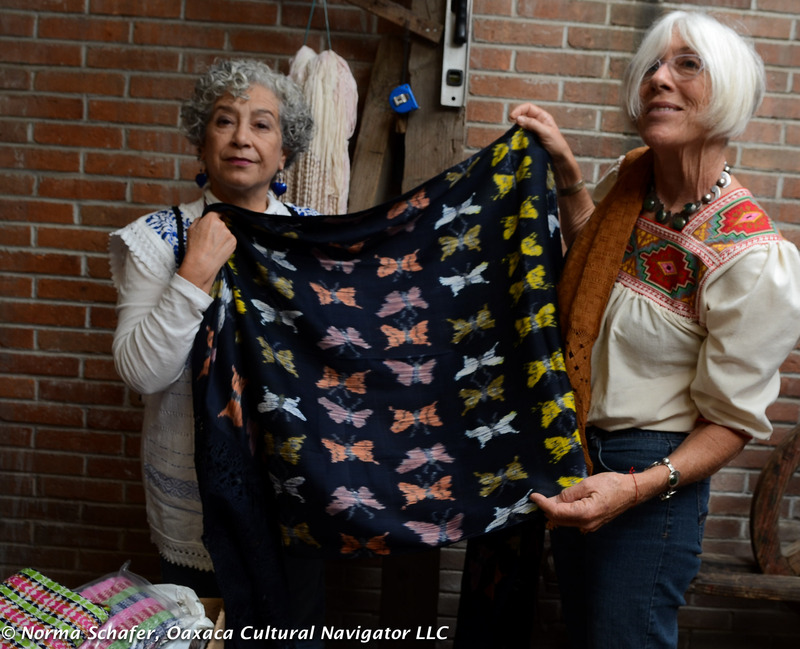 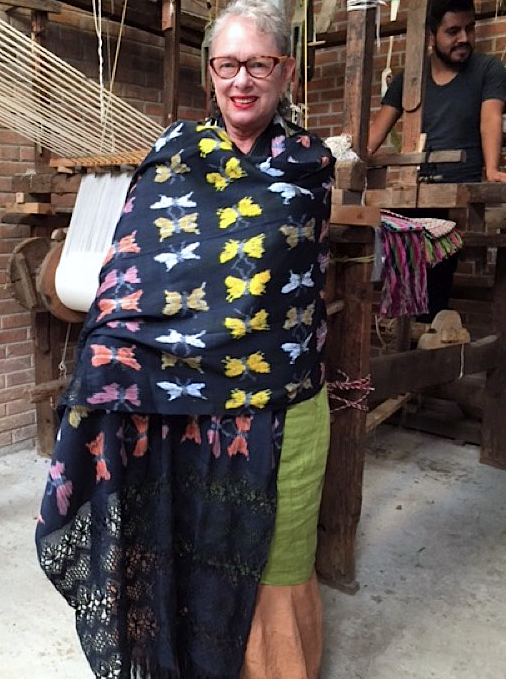 There are 150 butterflies hand-woven onto a black ground in the rebozo I am wearing in the photo on the upper right. 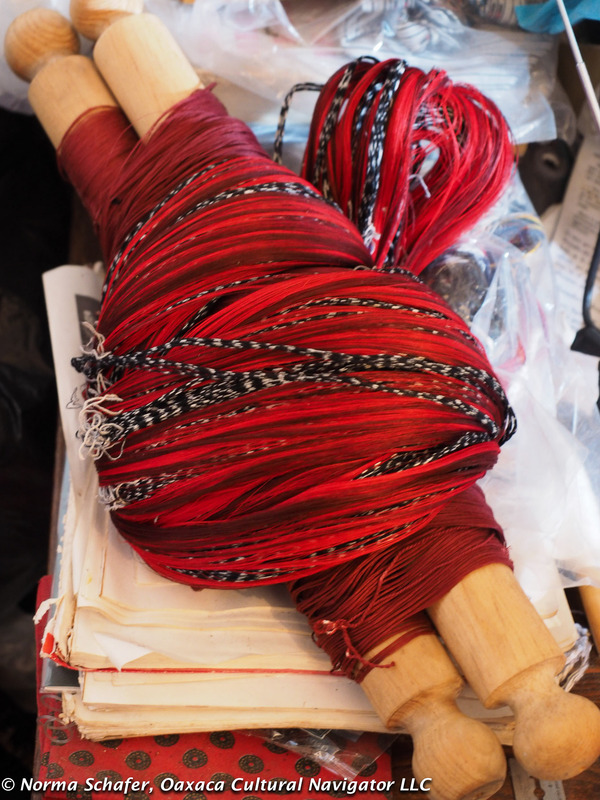 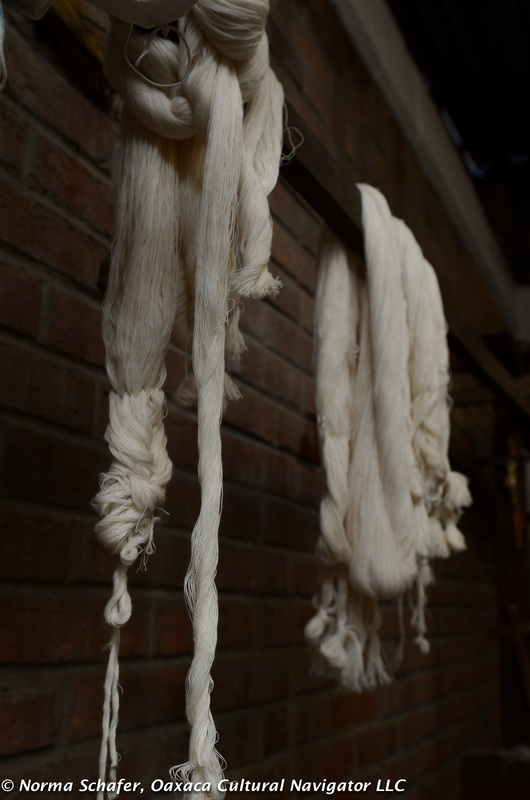 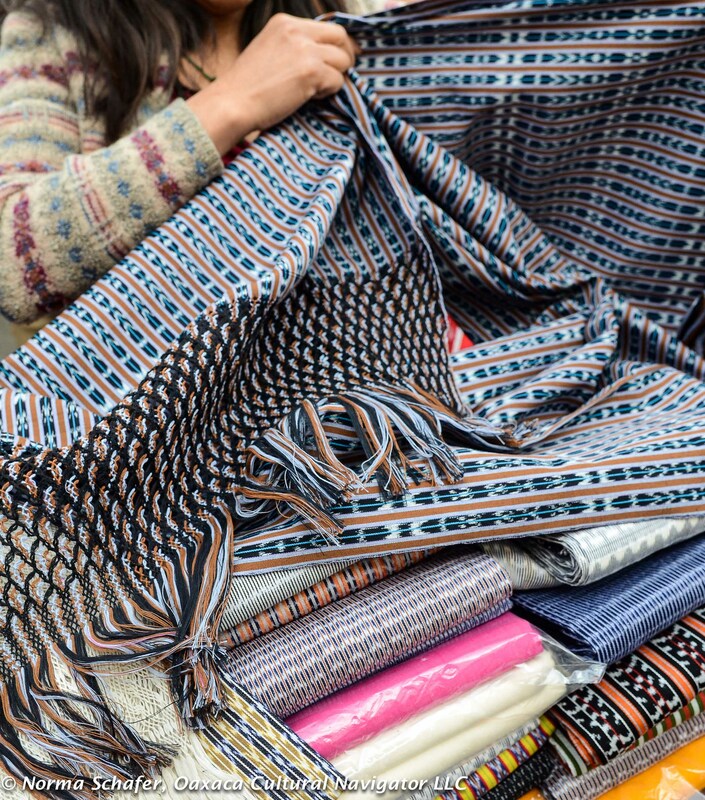 This is a one-of-a-kind textile that takes six weeks to weave and another two months to hand-knot the fringe. 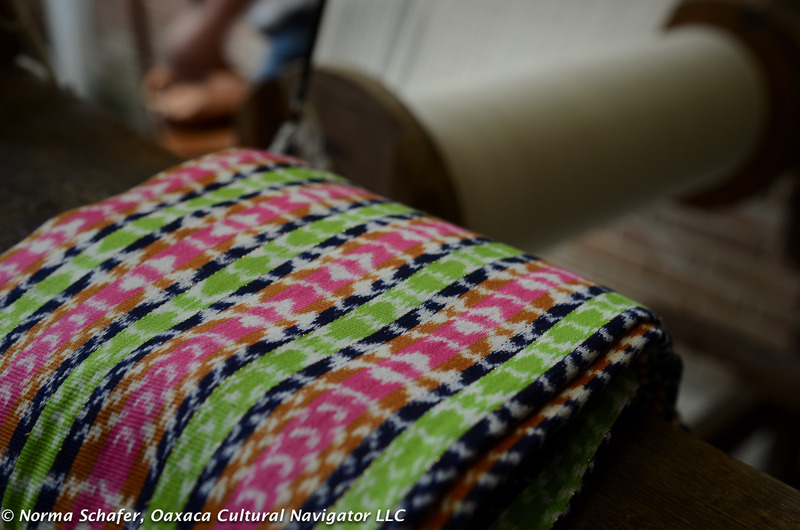 That’s not including the preparation of the ikat warp threads that I described in the post about Don Evaristo Borboa. 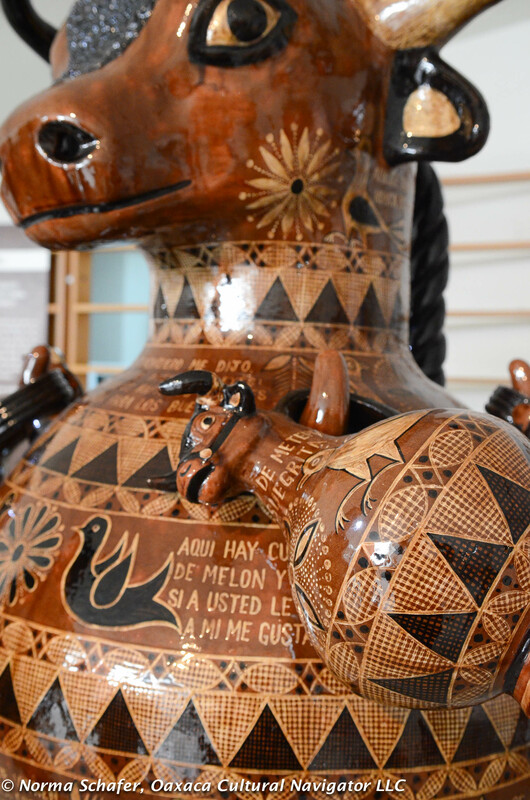 If you click on the photo you can see the extraordinary detail. 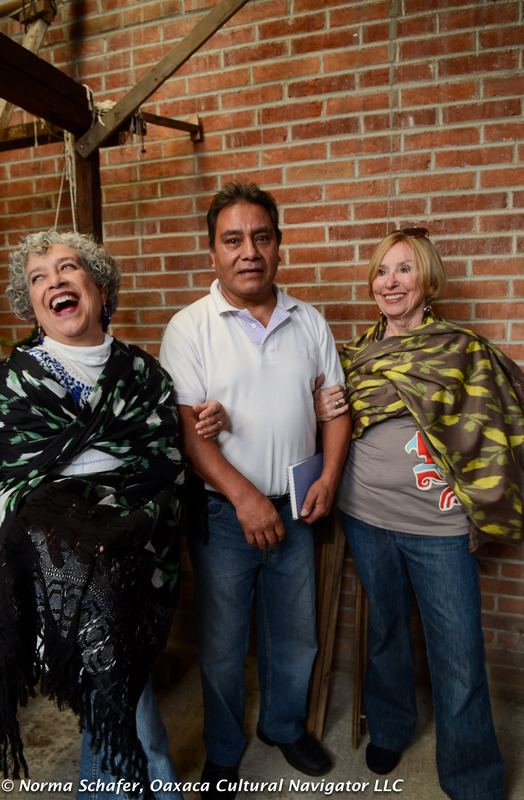 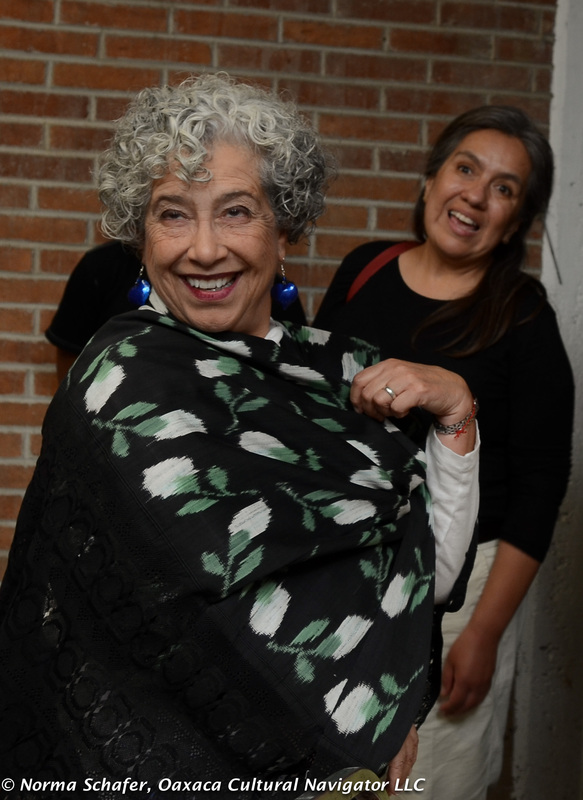 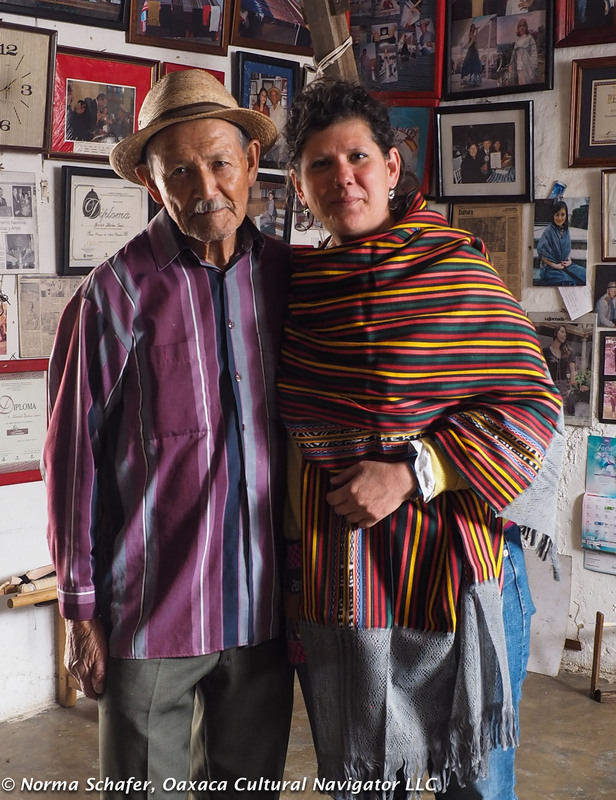 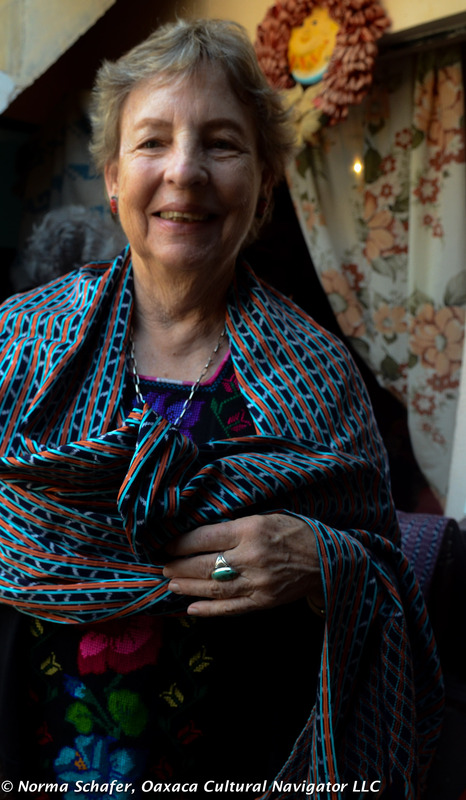 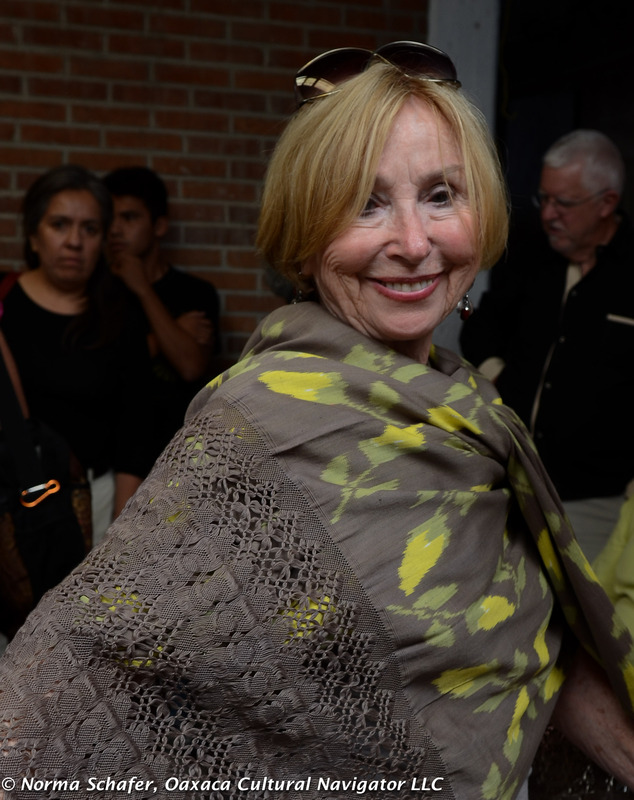 Above left, Linda Arroz wears this extraordinary rebozo with an eight inch intricately tied fringe (punta). 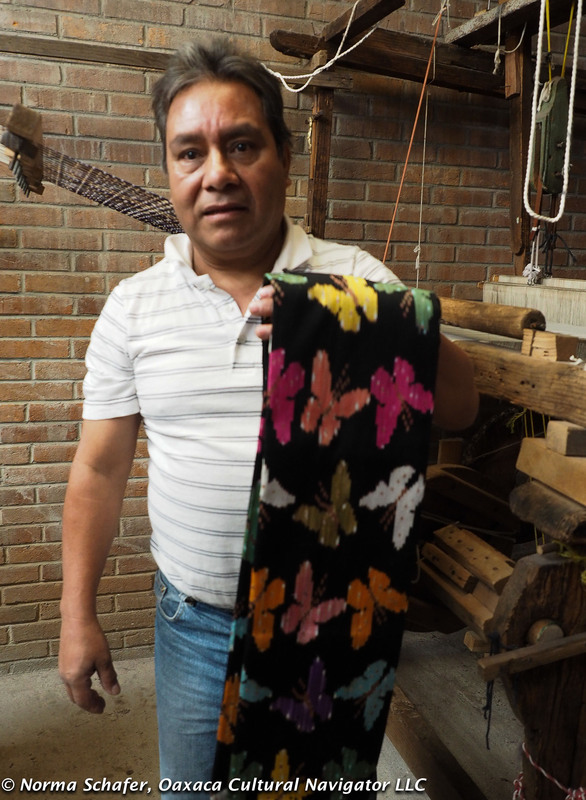 You can see the full beauty of this rebozo filled with flowers and leaves. 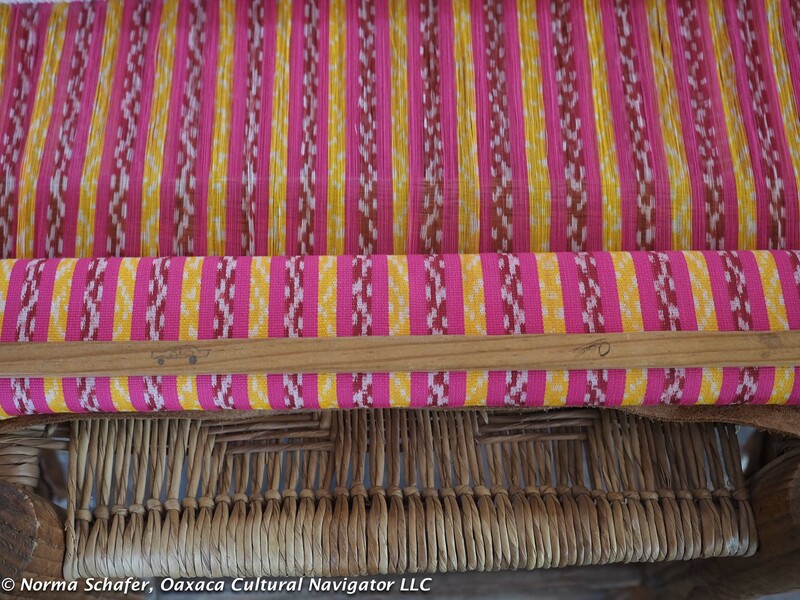 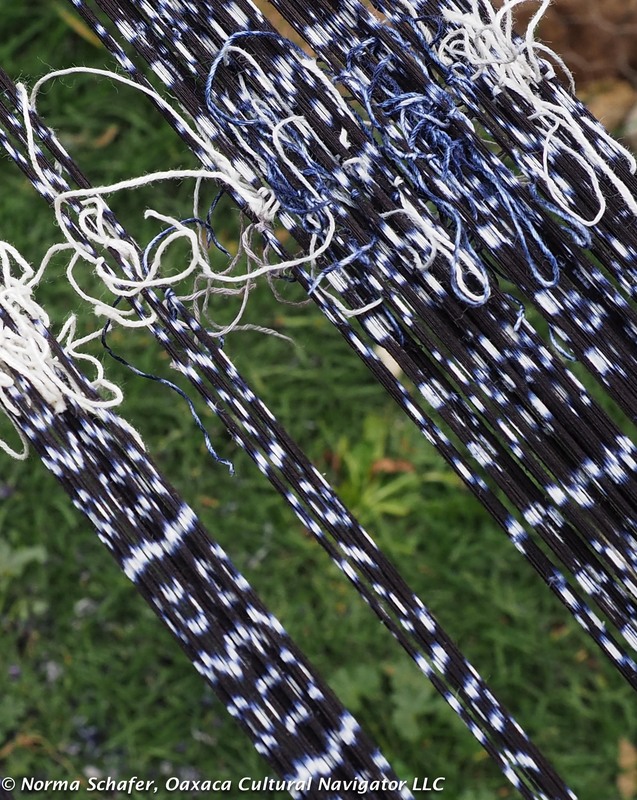 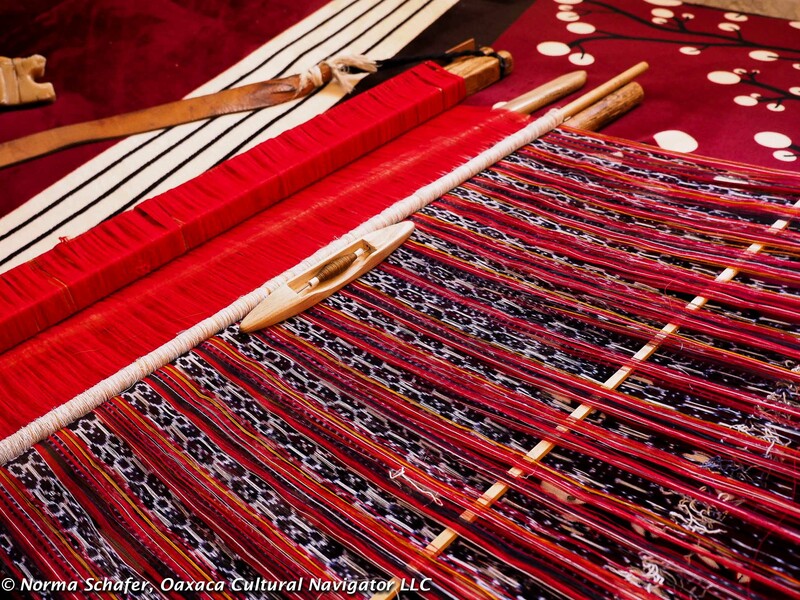 The ikat technique requires matching the pattern on the warp and weft threads, a laborious process. 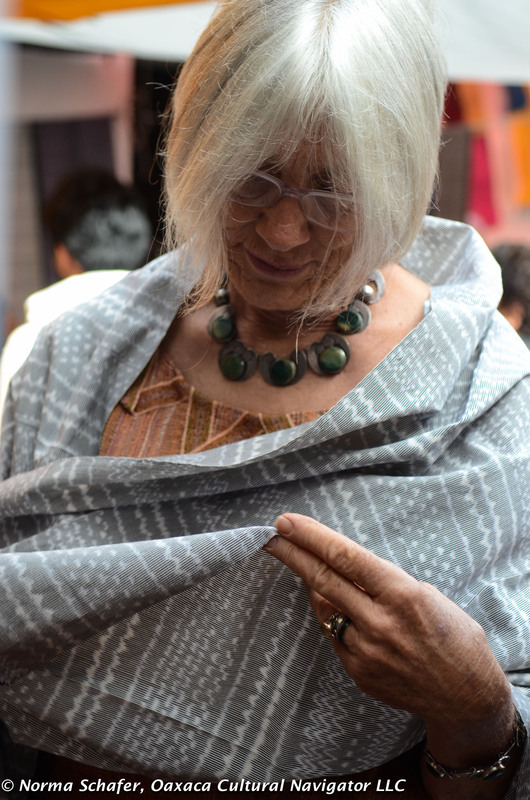 This textile, with 5,400 threads across the width, has the feel of silk although it is woven with the finest cotton. 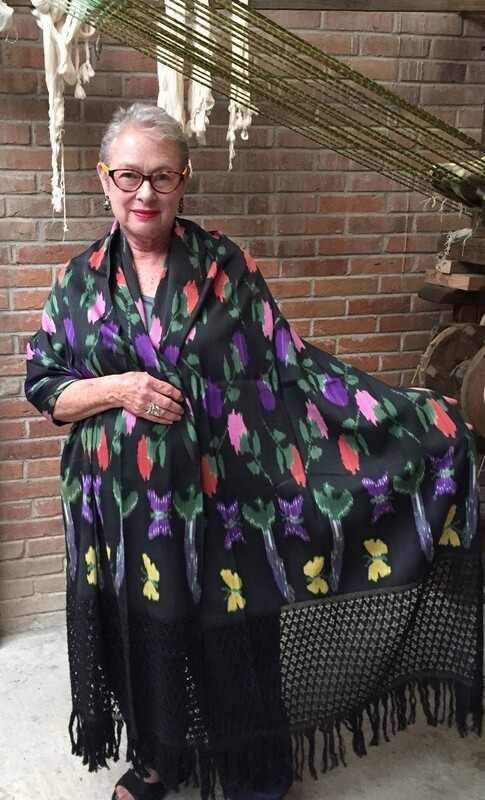 Linda G. fell in love with this green and white floral pattern on black. 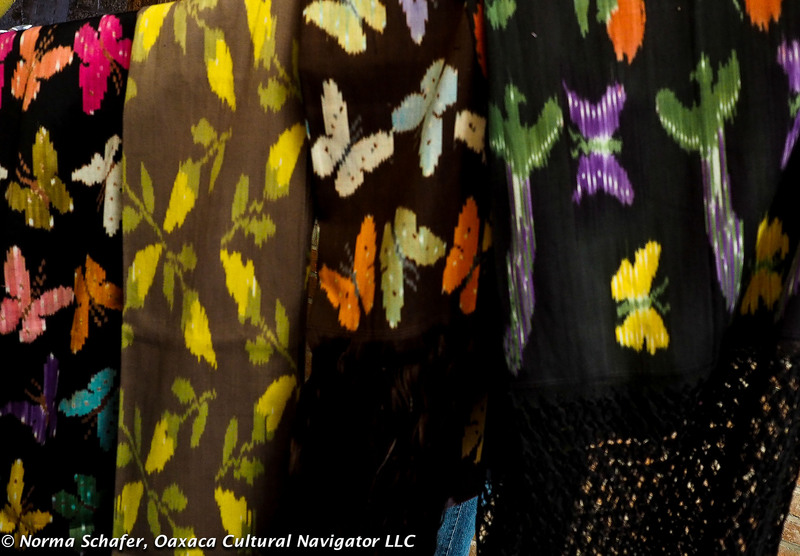 The texture created by the ikat in each flower is as if the pattern is an inch below water, shimmering with texture. 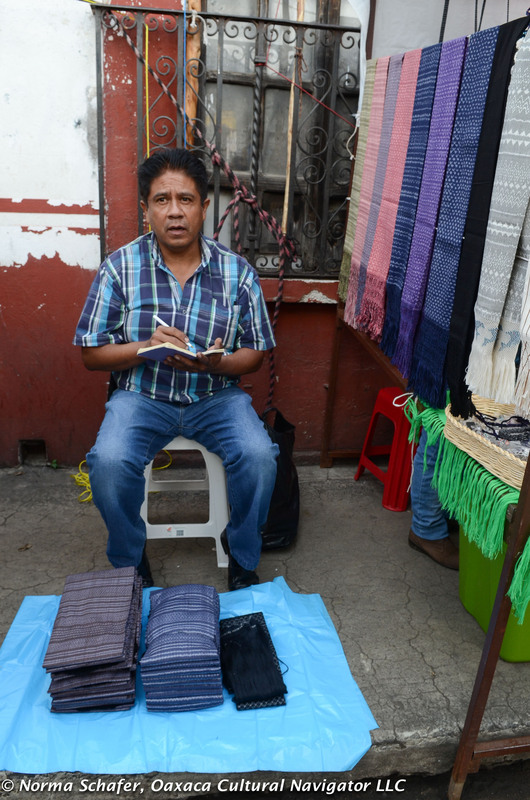 I think you can tell that Jesus Zarate is a humble man who is not used to the limelight. 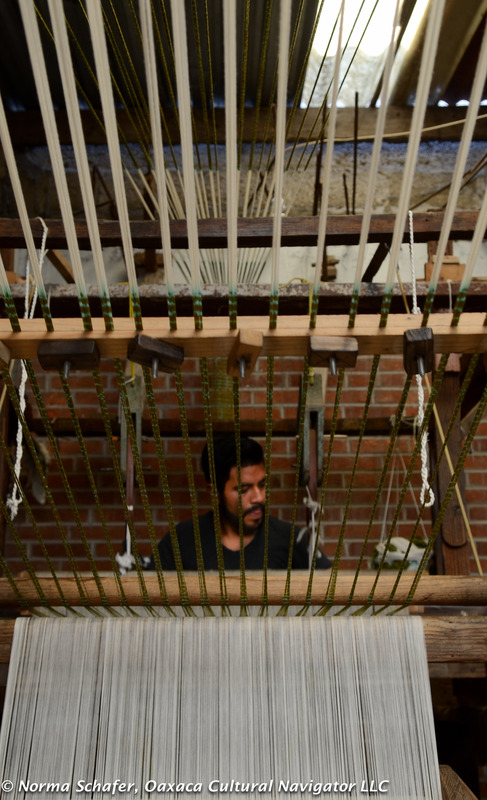 Jesus’ son works with him, concentrating on basic ikat production using the flying shuttle loom. 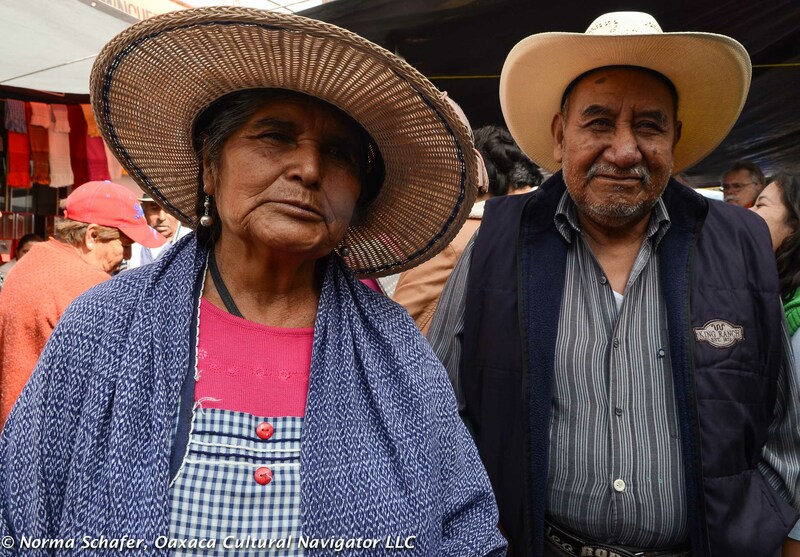 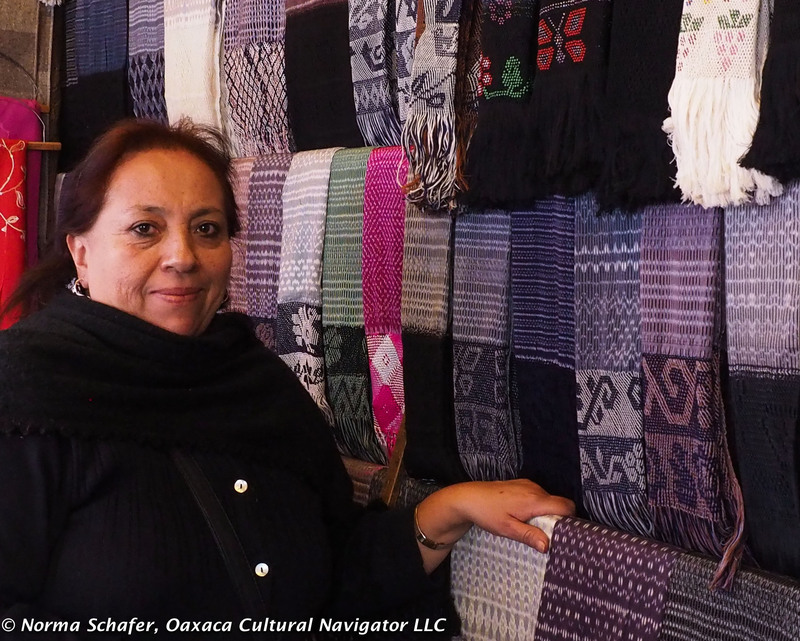 Together, they are building up an inventory but don’t have enough rebozos to show so won’t participate in the Feria del Rebozo this weekend. 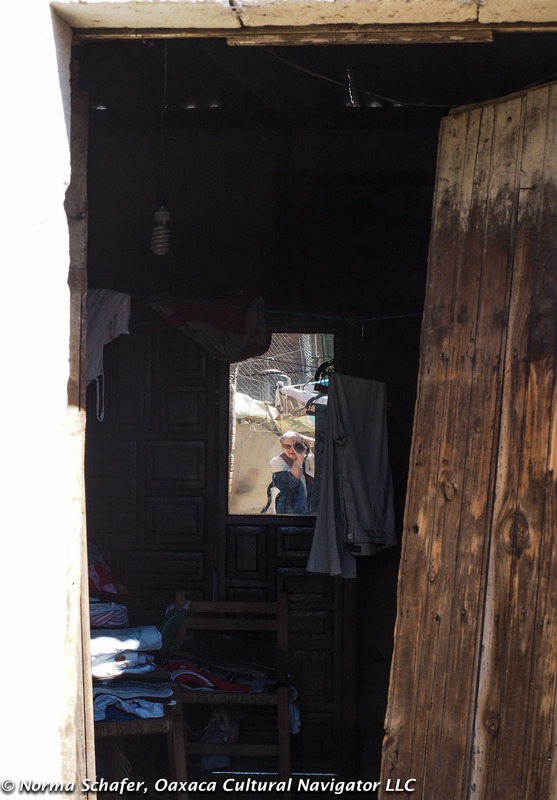 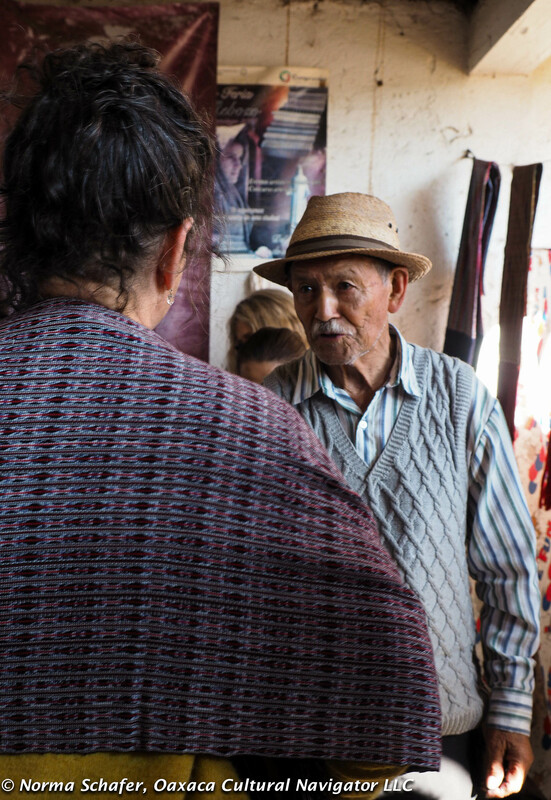 Tragically, Jesus lost two of his four sons and is helping to raise his grandchildren. 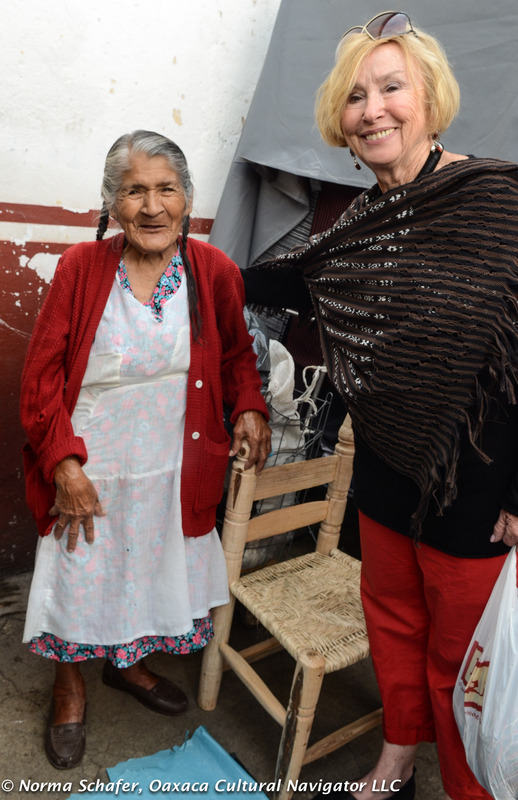 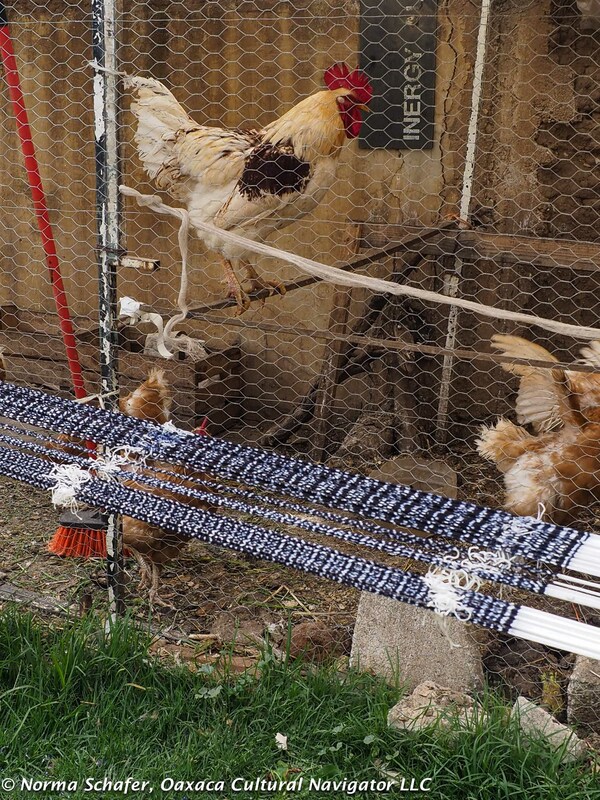 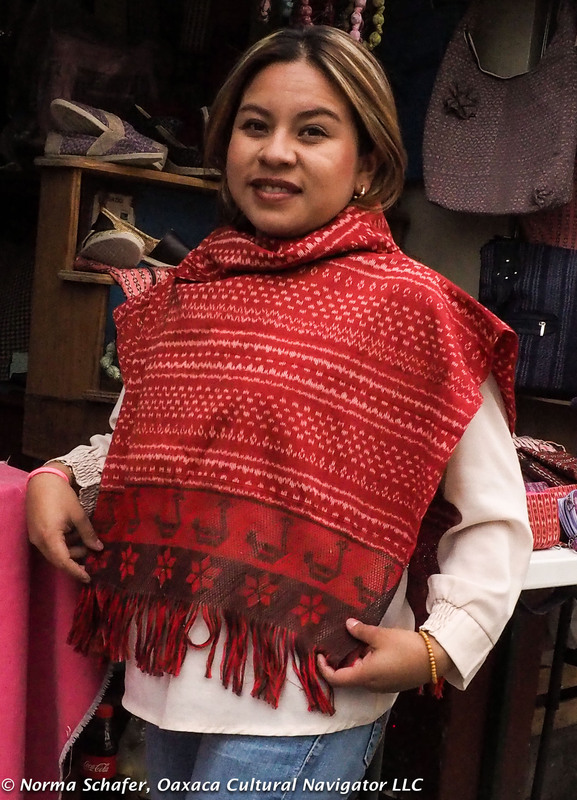 We felt privileged to support the family by buying rebozos. 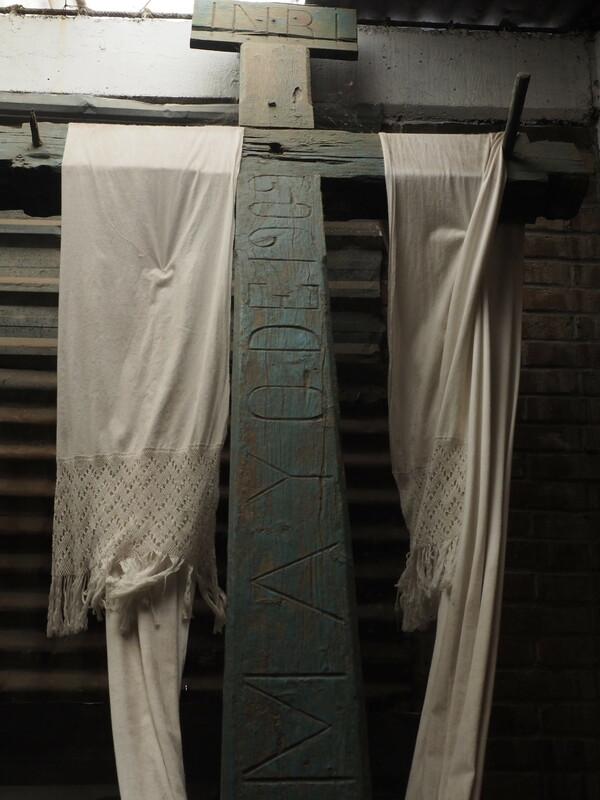 When we did, tears came to his eyes. 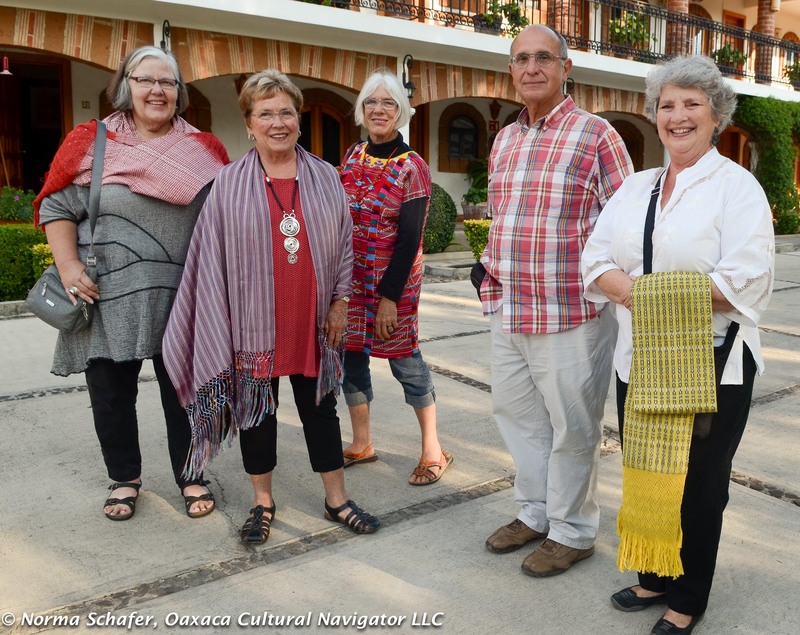 The rebozo I’m wearing above left is a painting of roses, butterflies and quetzal birds considered sacred in Mesoamerican cultures. 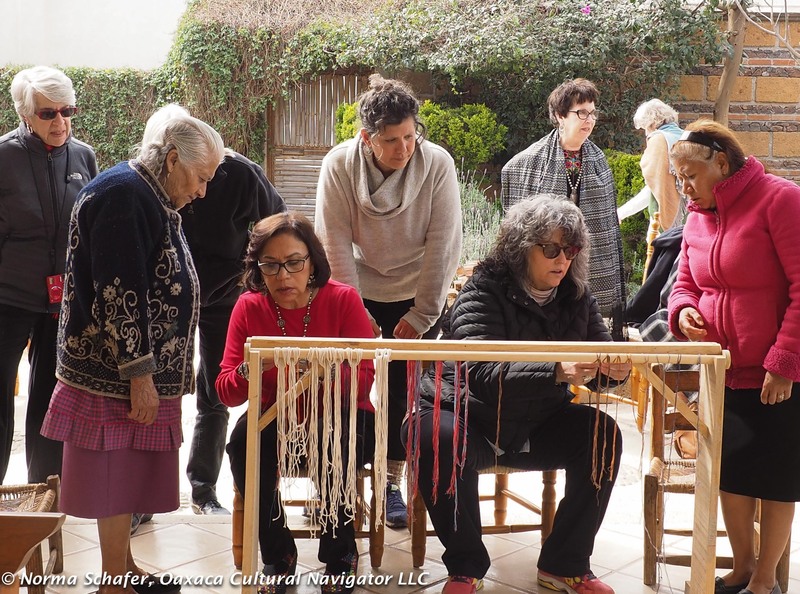 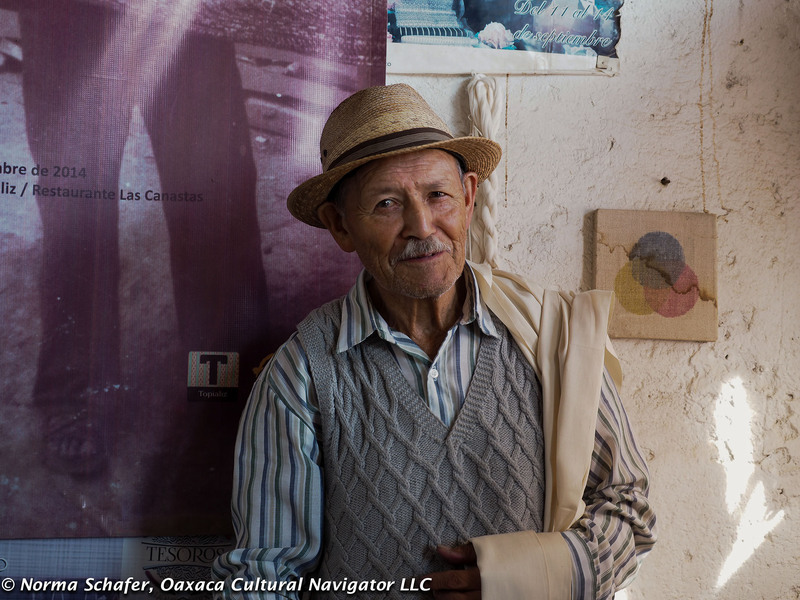 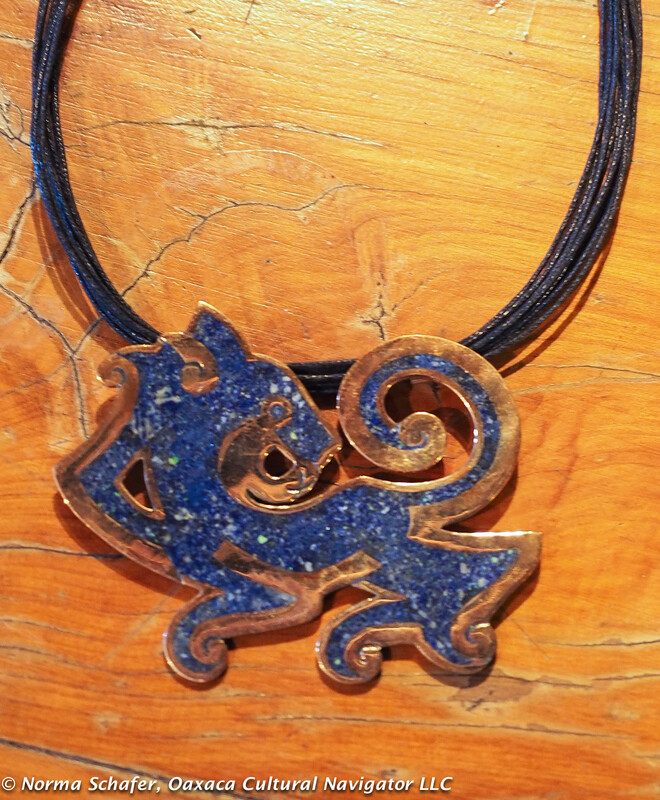 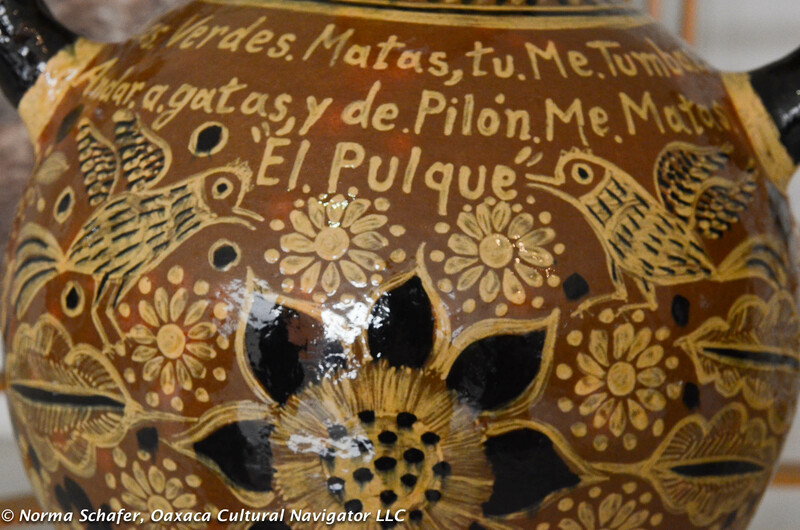 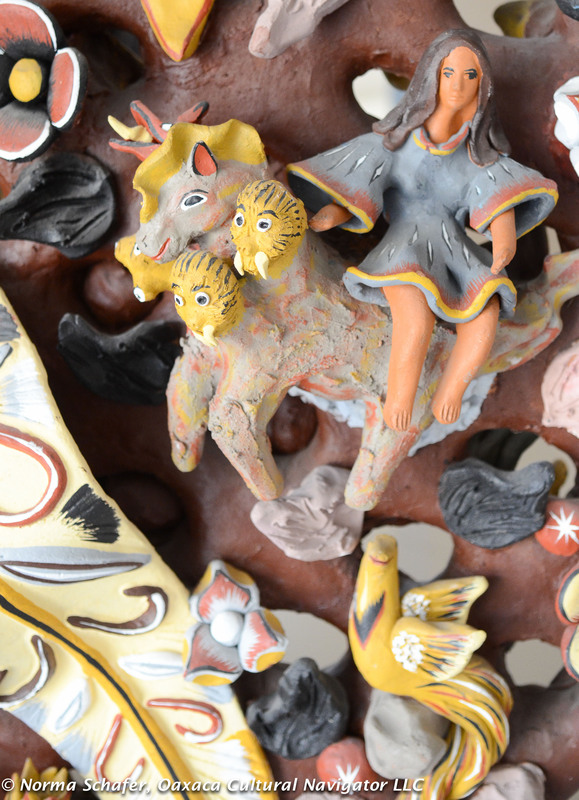 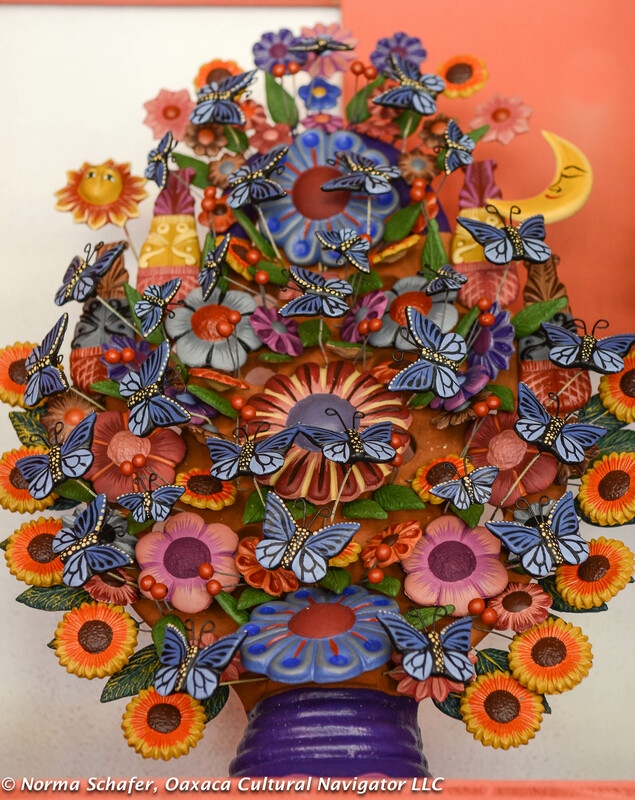 I’m traveling this week with Los Amigos del Arte Popular de Mexico, a support group for Mexican folk art and artisans. 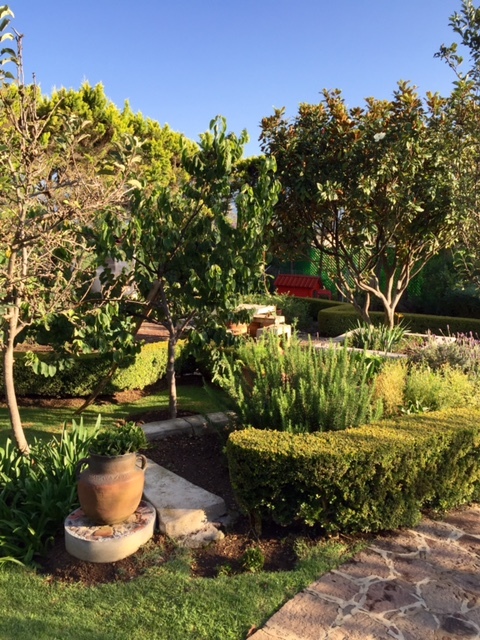 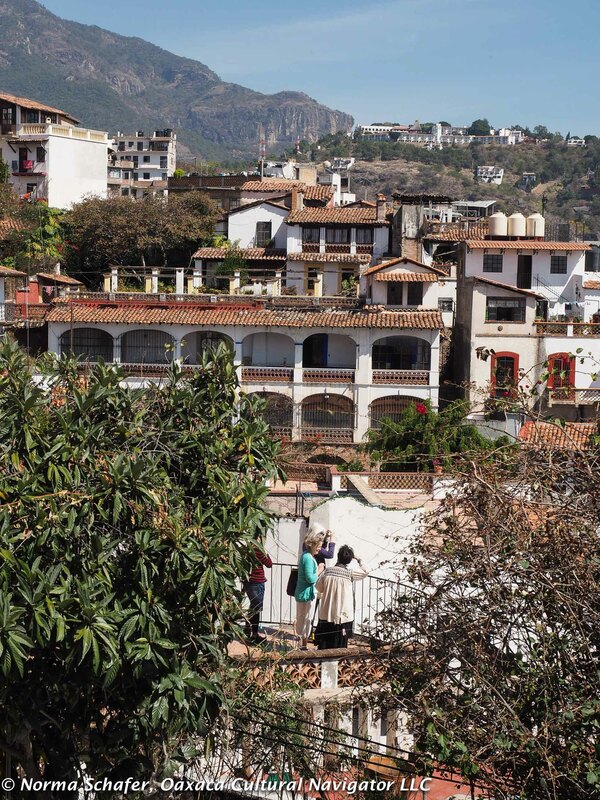 Our gracious hosts here in Tenancingo are Peter Stanziale and his wife Circe Beltran Lopez, owners of El Porton Inn Hotel, an incredibly beautiful oasis on the Tenancingo-Teneria road. 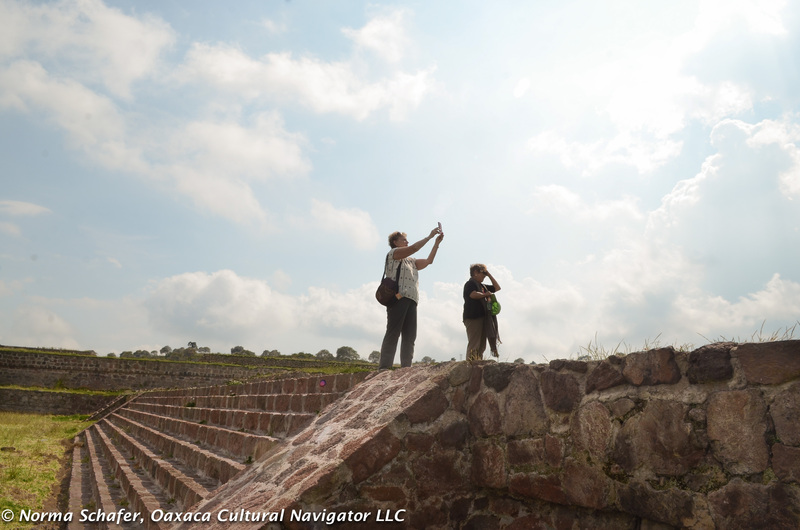 This experience has been so enrapturing, that I want to bring you here with me. 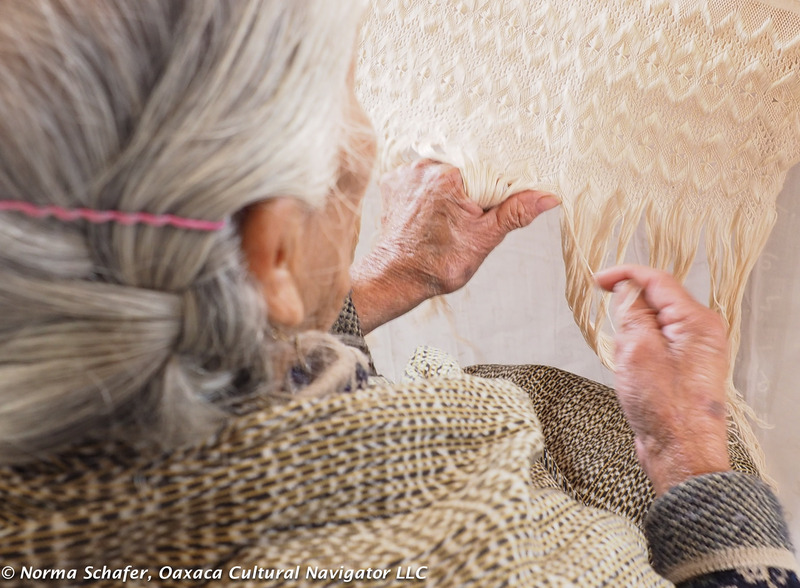 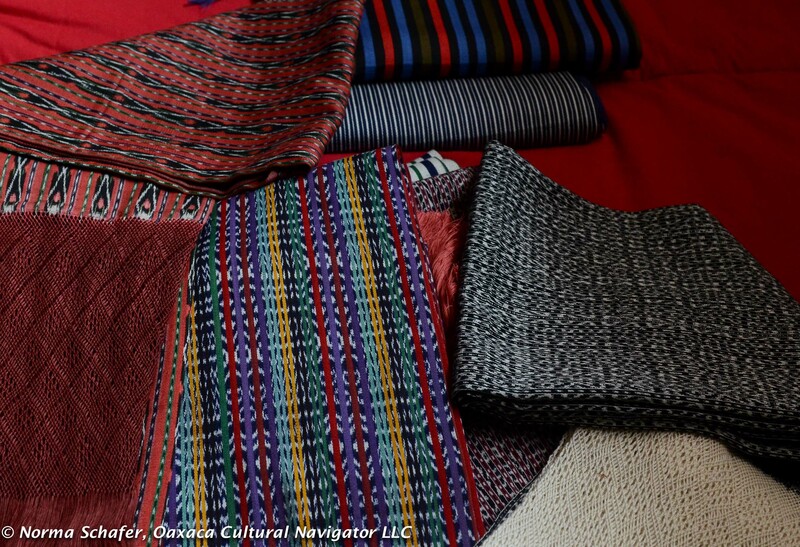 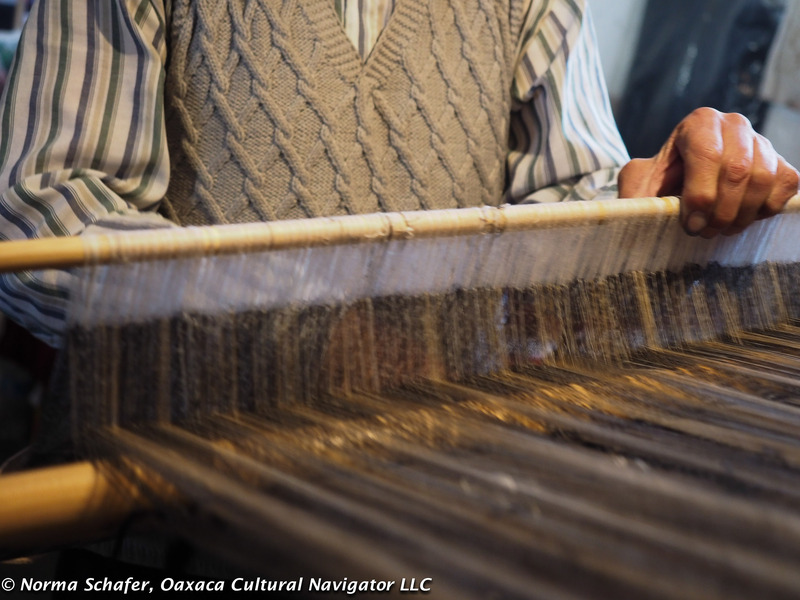 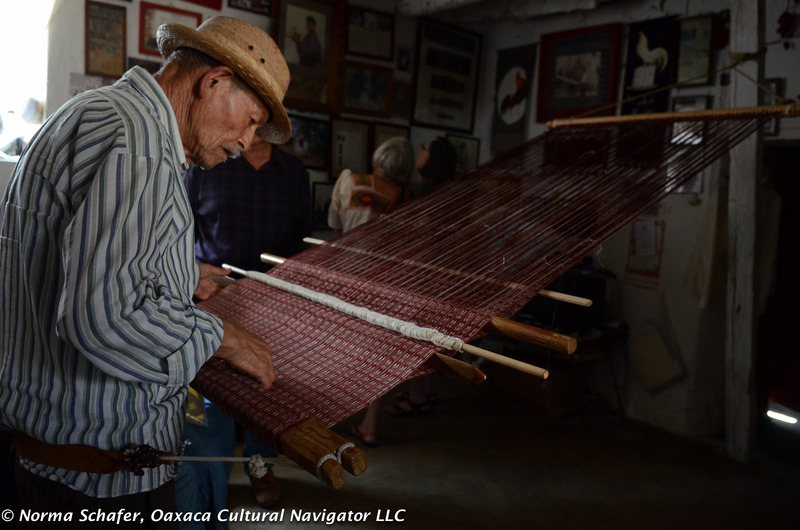 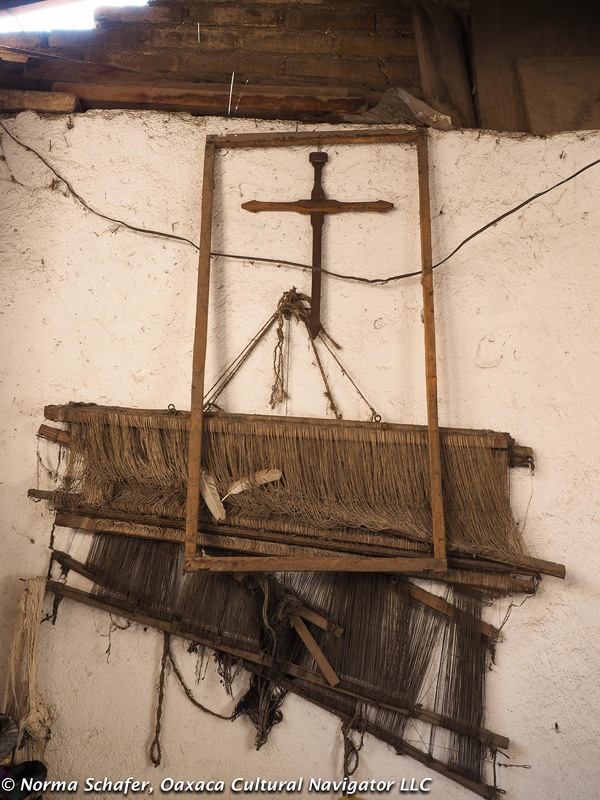 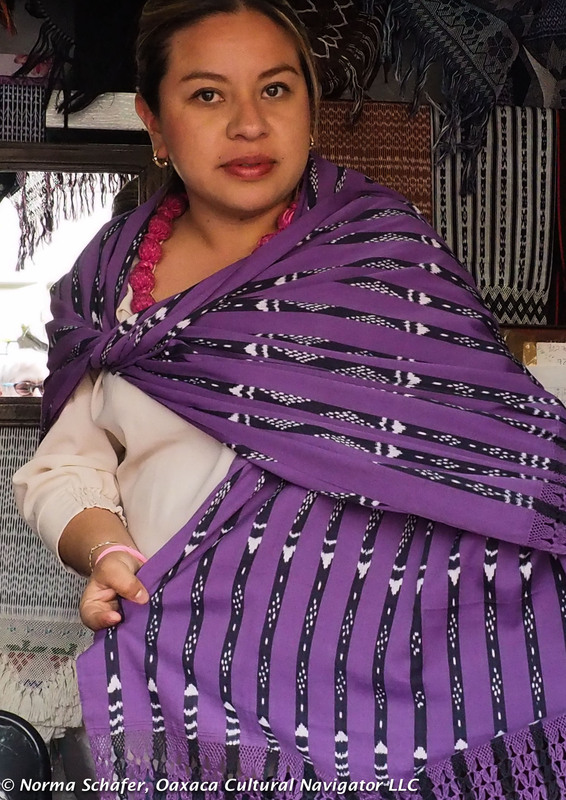 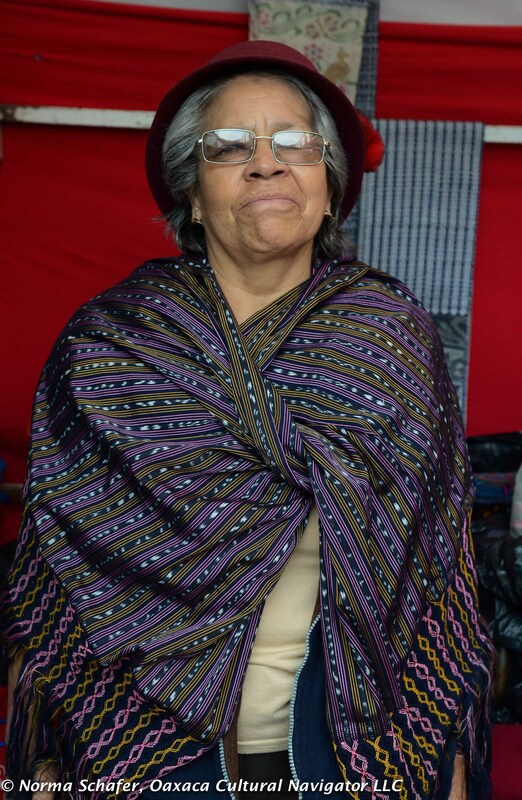 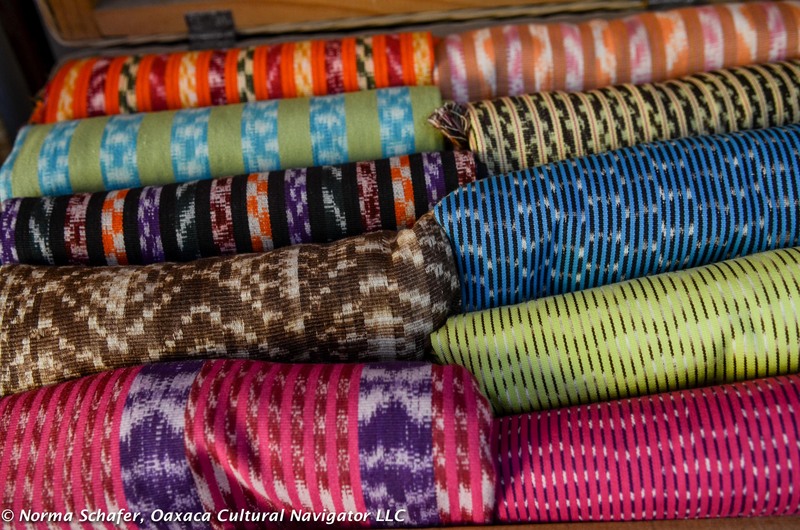 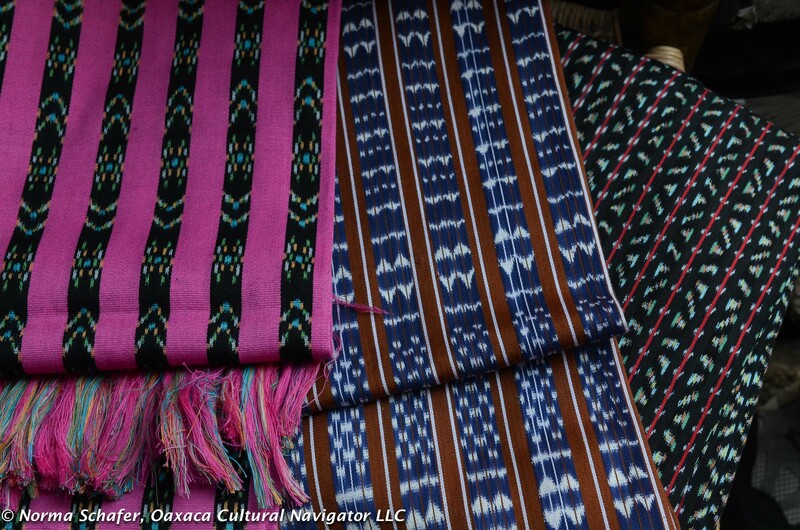 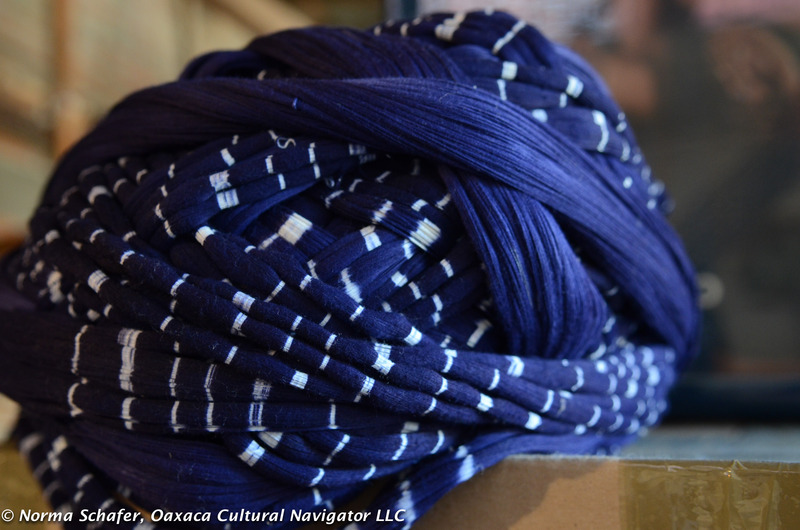 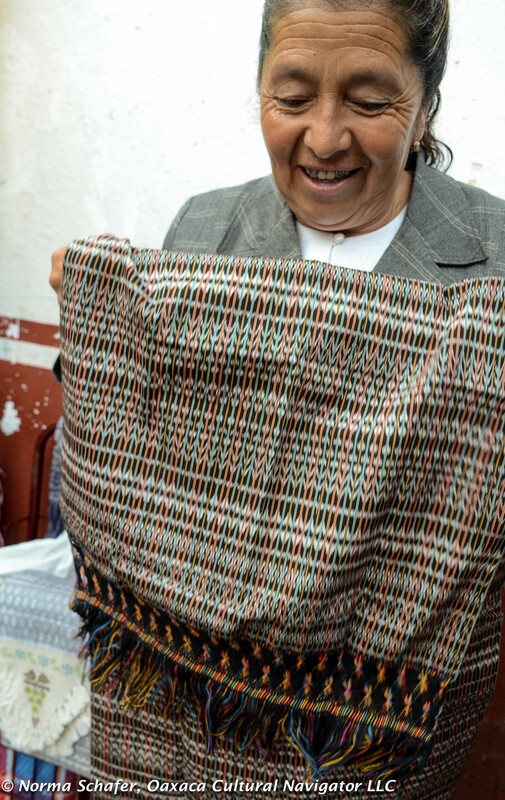 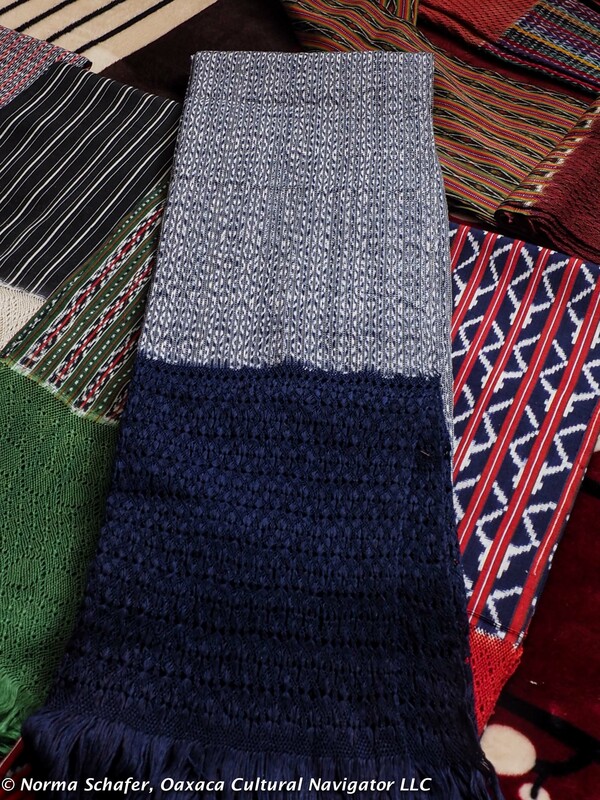 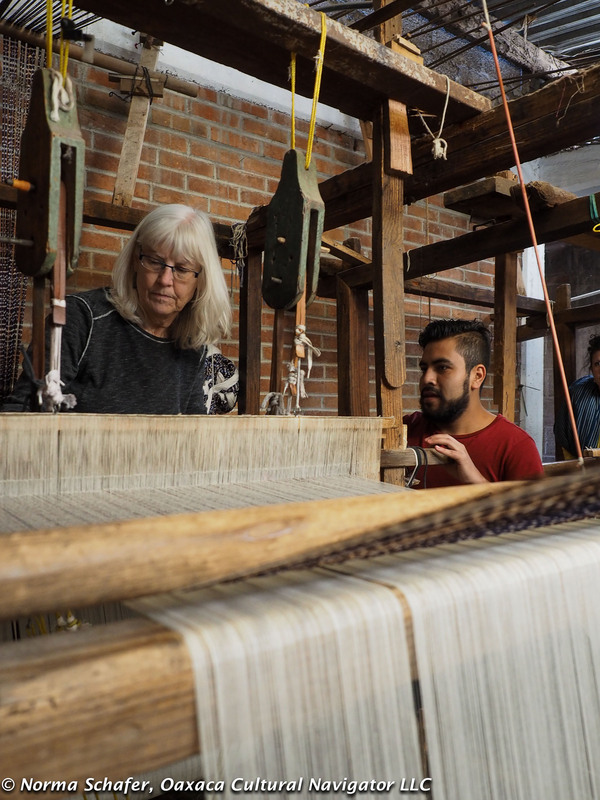 So, I’m going to organize a study tour to learn about and meet the rebozo weavers of Tenancingo. 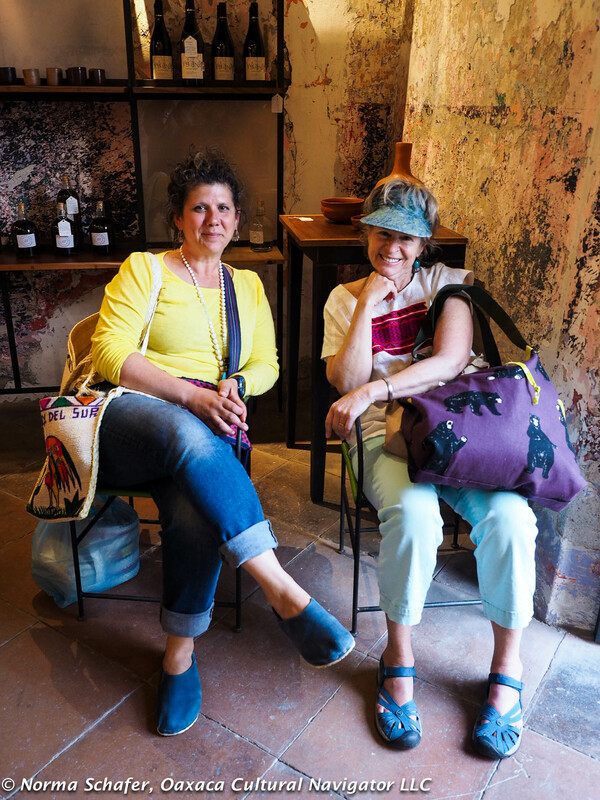 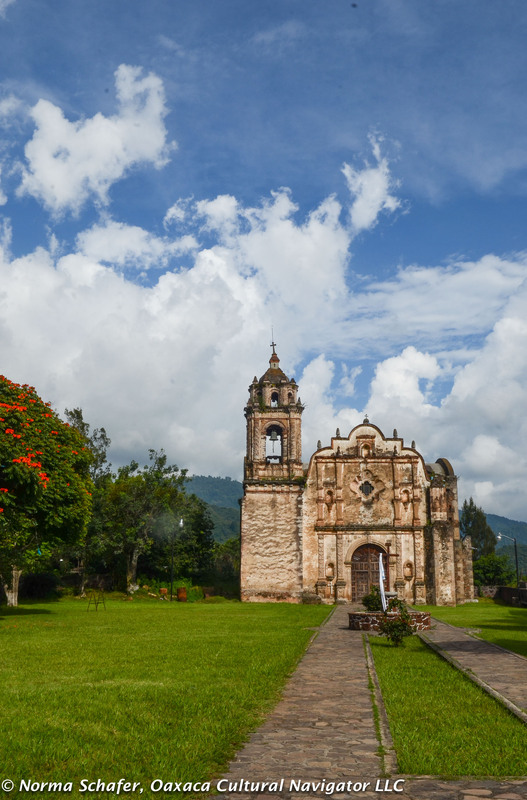 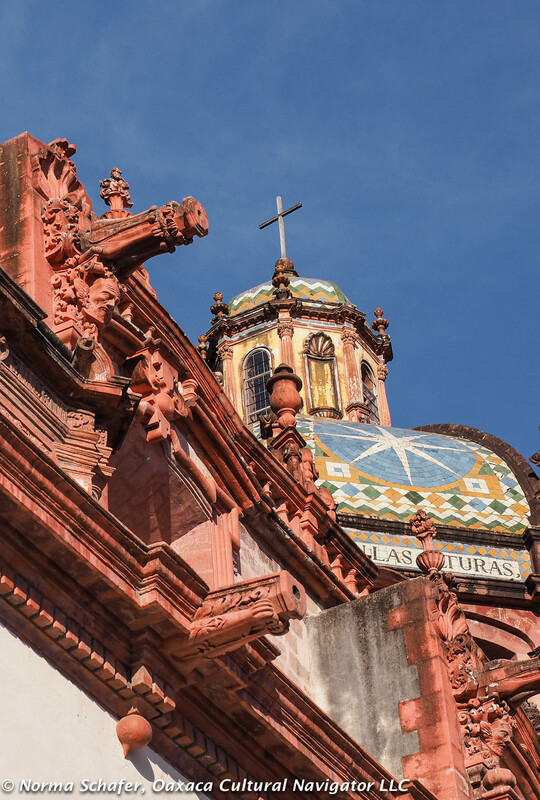 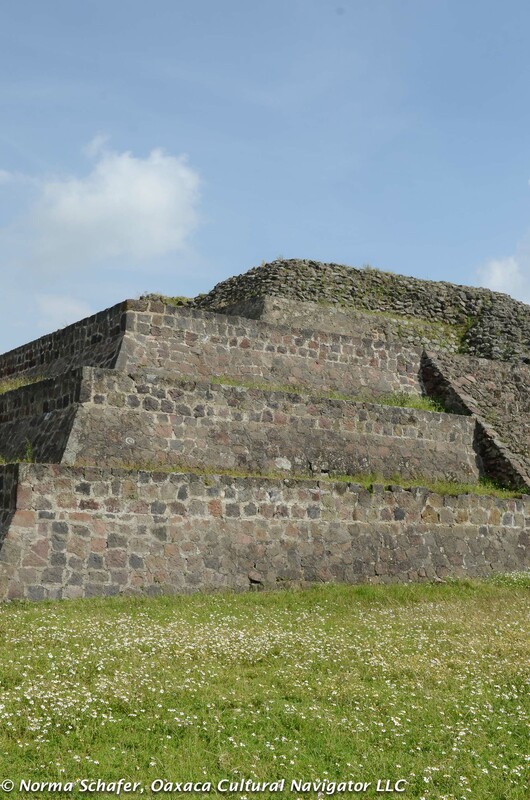 In addition, we will take a day trip to the silver capitol of Mexico, Taxco, explore the Pueblo Magico ceramics village of Metepec and the Pueblo Magico village of Malinalco. 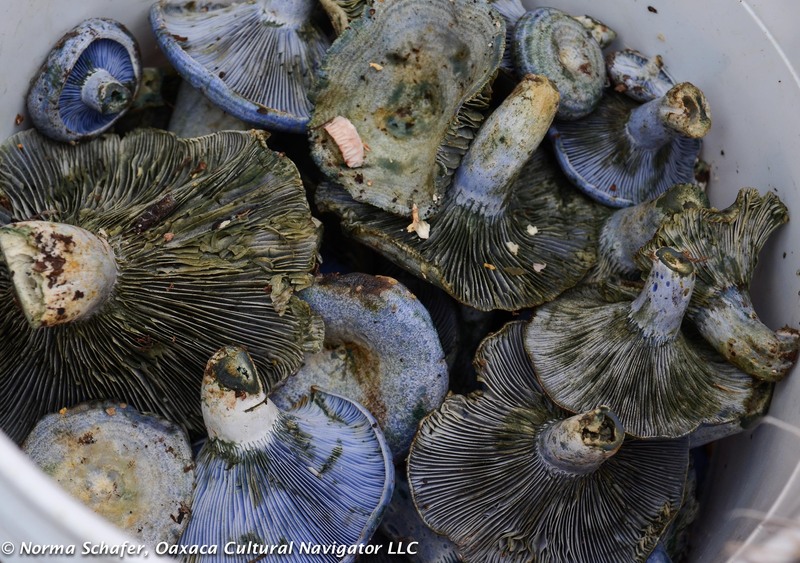 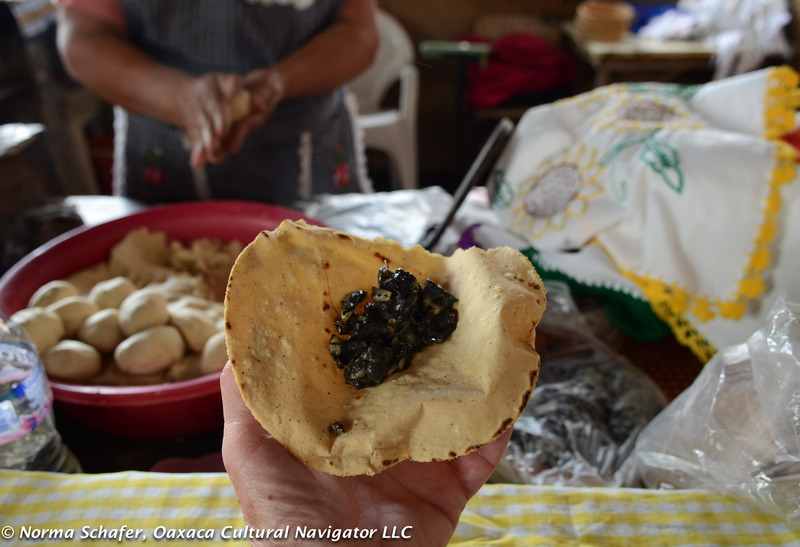 We will eat great food, climb ancient pyramids at important though remote archeological sites and immerse ourselves in Mexico’s folk art. 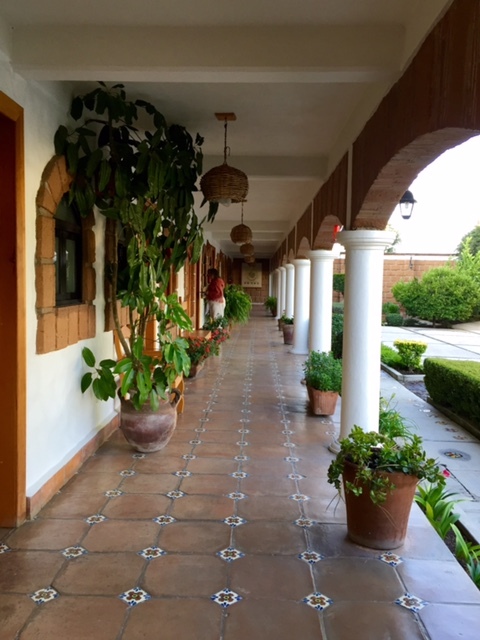 We might even have a spa day with massage and facials. 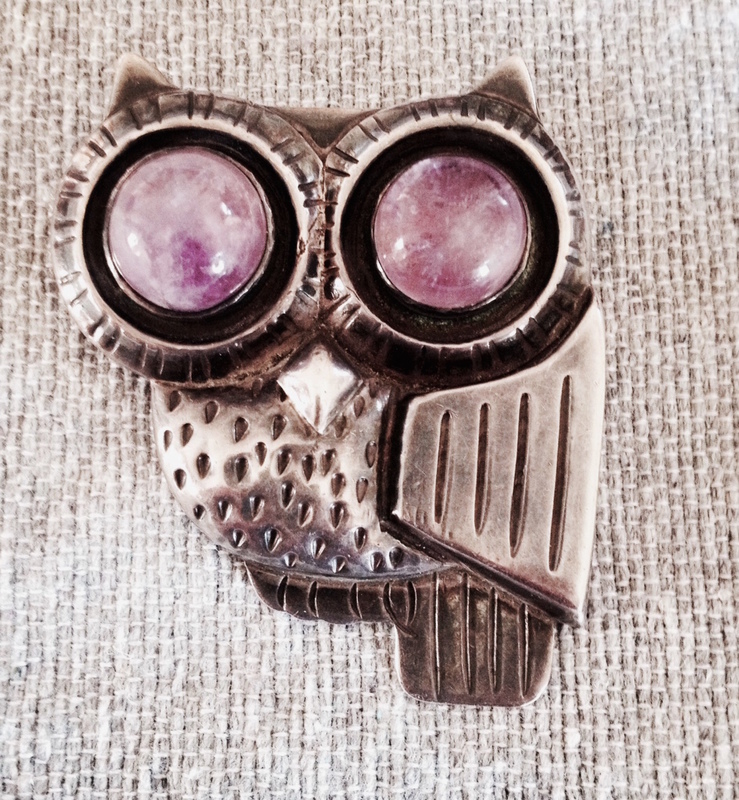 Send me an email if you want to know more!